Hi readers! I hope that you guys are having a wonderful Wednesday. Work is finally picking up and getting quite busy. With all this nice weather, people are travelling and going to cottages and leaving us with their dogs. I hope that you guys get to enjoy this nice weather and enjoy relaxing in the sun. So for today's nail of the day I'm going to talk about OPI's new Vintage Minnie Mouse collection. I picked up Nothin' Mouse About It because I thought it was the only truly unique polish from the collection. 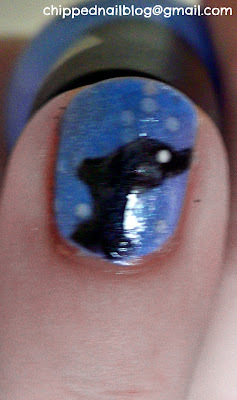 With that said, it is clearly meant to be layered so I tried it over a bunch of polishes to see how it would turn out. I feel like the light pink heart-shaped glitter gets lost on both OPI's Your Web or Mine and NOPI's I Stop For Nicole. I like how different it looks overtop of Essie's over the edge. My top three base colour picks would be Essie's Fiji (light pink), Essie's secret story (bright pink), and Essie's e-nuf is e-nuf (bright coral). 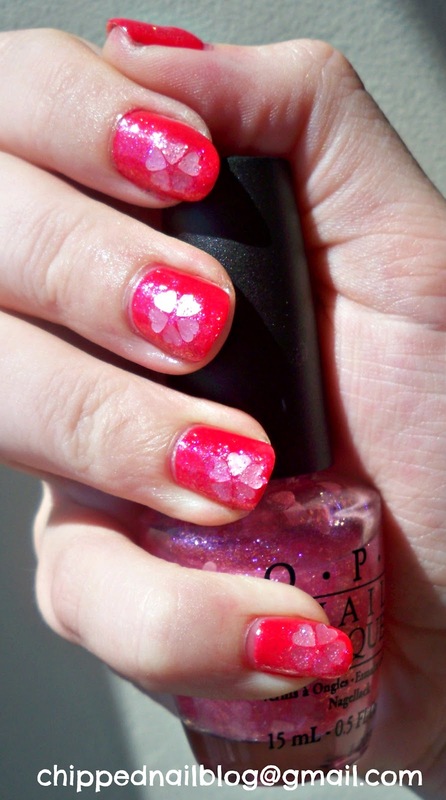 OPI's Nothin' Mouse About It is a sheer pink shimmer topped off with cute little pink glitter hearts. As a self-confessed glitter lover, I must say this polish looked magical in the bottle. I must admit, I was a little disappointed with how the hearts were distributed throughout the bottle. Sometimes you would get five hearts on the brush while other times you wouldn't get any. This is why I chose to do a cute design with the hearts for the final mani. The glitter base itself was very smooth and easy to apply, I just wish that the hearts were more evenly distributed. Overall, I would recommend picking up Nothin' Mouse About It because of the nostalgia factor and the awesome shimmer. I think this polish will be great around Valentines day and whenever the mood is romantic. This will be a mani that I won't want to take off. Hey guys! So today's post is a little late, but better late than never right? Anyways, thanks for the supportive comments yesterday, it really did lift my spirits. I've finally gotten back home and all I can say is HOT! Wow, with no air conditioning and the windows being closed while I was away, my apartment has turned into an oven. Hopefully by tonight it will be much cooler. What's the weather like in your neck of the woods? I hope you guys are enjoying lots of sun. Today I'm talking about one of the new fabulous finds that I recently bought. 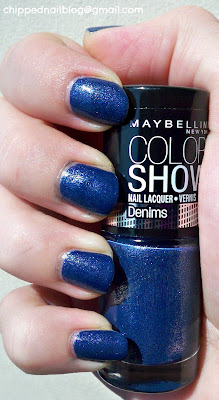 This is Maybelline's Styled Out denim polish. It's a deep blue polish with a hint of silver sparkle that dries with a matte finish. I really do agree that this polish looks like denim. I love these funky polishes and I think it can really spice up a manicure. This polish has great coverage as well. On top of a base coat, you can get away with total coverage in one coat. Honestly, there aren't many polishes that I can say one coat is truly enough but Styled Out is great. Because this polish is meant to look like denim, I wouldn't recommend a top coat (the glossiness takes away from the effect). Overall, I give this polish two thumbs up. I love how it applies and the fact that it really does look like denim. I feel like this polish would be great for fall or winter and doesn't really fit the summer trends. Is this a polish you've picked up? Have you found any other denim polishes? If so, do you have a favourite? Hi y'all. Well, I can officially say that I've run a 10km race (and signed up for my next one). This is an accomplishment that I thought would never be possible and I am very proud of. Yet this weekend also brought me to a realization that somehow being behind a computer screen makes people think that they can say anything they want no matter how mean. Honestly, I write this blog so that I can express my creativity and meet others who love nail polish as much as I do. But recently I've read some nasty comments others have made on a forum about my nail art. To those who don't like what I do, why are you taking your time to read my posts? I'm not expecting to please everyone and I'm not here just to gain readership. I enjoy reading comments and connecting with other polish lovers and appreciate all of you that post positive feedback. Like we learned in kindergarten, if you have nothing nice to say, say nothing at all. Now that I've ranted, here's today Monday Mani! For today's mani, I used two new polishes by Oh My Gosh. I must admit, I love how these polishes apply on their own but I also love how they look together The base colour is OMG 008 Bright Yellow (to read the review, click here). This creamy yellow was the perfect backdrop for some cute polkadots. For the blue polkadots, I used OMG 009 Cobalt Blue. I will be reviewing this polish later this week so stay tuned! Once I was done with these polkadots, I thought I would spice it up with additional yellow polkadots on top of the blue ones. 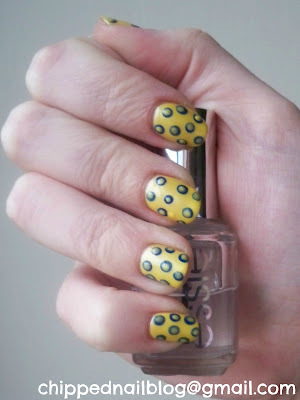 I used the same yellow polish for these polkadots and I just love how this mani turned out. Because I had two levels of polkadots, I needed two coats of top coat to even out the surface of the nail. Overall, I must say this is one of my favourite polkadot manis up to date. 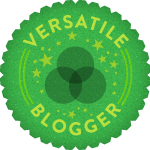 For those of you who honestly enjoy my blog, I thank you every much for the time you take to connect with me through comments. I treasure each and every comment and love seeing your own creative posts. Keep those fingers pretty & have a great Monday! Hi readers! Today I'm writing you from Ottawa! This weekend looks like it'll be super warm and super fun. Today we are going to the health and fitness expo downtown to collect our race kits and to check out some awesome deals on running gear. Though I grew up in Ottawa, I don't generally head downtown so this will be very exciting. I hope you guys are getting to enjoy wonderful weather and for my American readers, I hope that you have a great Memorial Day long weekend. For this funky Friday I'm going to talk about a new polish that I picked up from Shoppers Drugmart. Oh My Gosh 008 Bright Yellow is a softer buttery yellow unlike the neon colours out there right now. This polish is also very economical (less than 5 dollars a bottle) and is a small enough size that you will be able to use it up. I was impressed with the application of this polish. It was very creamy and smooth and just the right consistency. I was a little disappointed that it took three coats to get solid coverage but it isn't a deal breaker in my opinion. This polish dried with a high gloss finish but I would still recommend a top coat. Overall, I was very impressed with this polish. After wearing it for four days, it didn't show any signs of wear or tear. I think that this polish is also a great colour for nail art project (hint, hint) and will be making many appearances on my nails this summer. 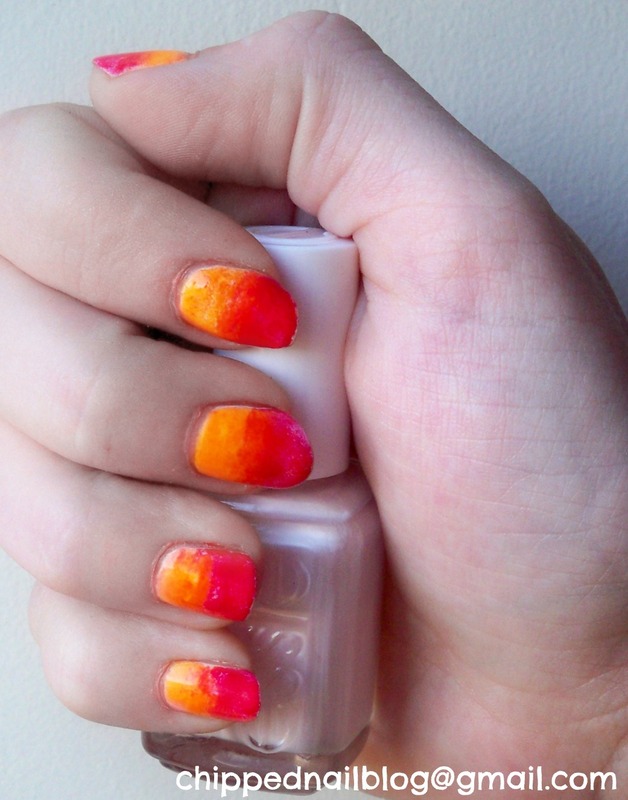 Are you a fan of neon polishes or do you like toned down versions of neon colours? 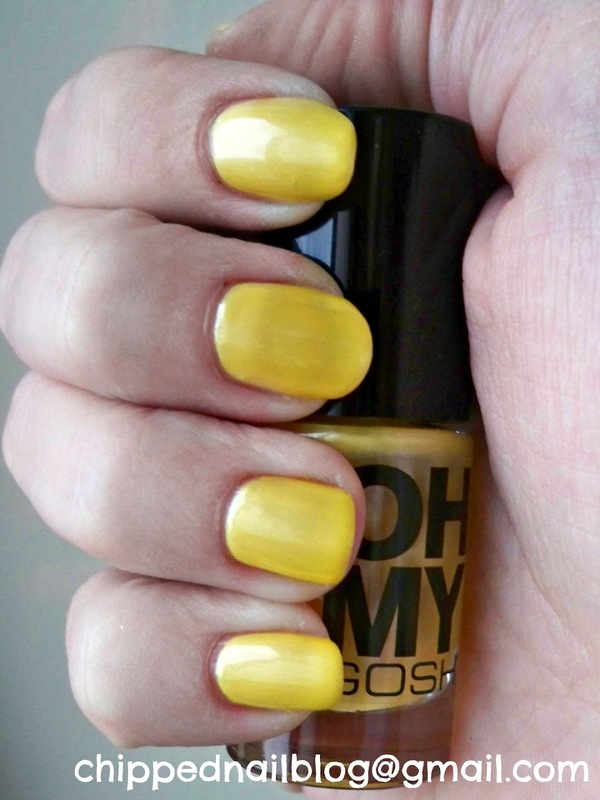 Have you tried any other Oh My Gosh polishes? Let me know which ones are your favourites! Hi readers! I hope that your Thursday is wonderful. It's bright and hot here today. I'm leaving town for a few days to head to my 10km race in Ottawa this weekend so I'm super pumped. But don't worry, I have lots of good posts that will be posted throughout the next few days. These will feature many new polishes along with some funky nail art. So wish me luck as it looks like it will be quite hot for my run (and I don't do well in heat) and I hope you guys enjoy the posts for the next few days! Today I'm featuring some nail art that has become quite trendy. I named this Malibu Sunset because it is similar to the logo of the infamous Malibu rum (which was a total coincidence). To begin, I used three coats of Essie's Fiji (a light pink). Once Fiji was dry, I sponged on Essie's e-nuf is e-nuf onto the top half of my nails using a makeup sponge. I let this dry and then I sponged on Essie's Action. Once both of these colours were dry, I blended them together with the sponge using extra orange and red. This created the look of the iconic sunset. Honestly I love how this really plays to the two significant nail polish trends right now (neons and gradient). These are my favourite Essie colours for this summer and I can't wait feature them again! Hey guys! I hope that your Wednesday is going well. I'm so excited for today's Wild Wednesday so lets just jump straight to it! 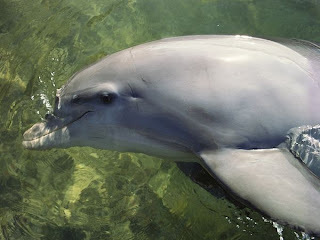 Okay, so today's Wild Wednesday is featuring the bottlenose dolphin thanks to the suggestion of www.BigDaddyBeauty.com. These curious and friendly creatures are being threatened by careless fishing practices that cause dolphins to become entangled in the nets. Dolphins travel in social groups known as pods and can jump as high as sixteen feet high. Dolphins range from 10 to 14 feet in length and can live for 45 to 50 years. So for this manicure, I thought I would recreate the bright blue sparkling waters that the bottlenose dolphin inhabits by creating a jelly sandwich. For this jelly sandwich, I used two coats of Nicole by OPI Nothing Kim-pears to Blue, one coat of Nicole by OPI Make U Smile, and then a final coat of Nothing Kim-pears to Blue. I love how this captured the brilliance of the Caribbean Sea. 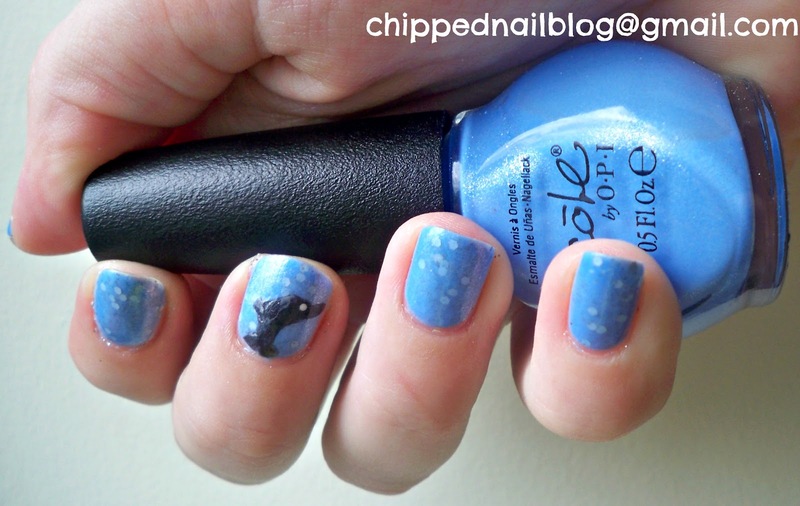 In order to create the dolphin, I used Essie's over the edge. I free handed the dolphin and used a dotting tool to create the perfect eye. Overall, I think it really captures the look of a dolphin jumping out of the water. If you love animals and the planet as much as I do and would like to join the Wild Wednesday movement, feel free to message me and I will add a link to your blog on my Wednesday posts. Otherwise, if you have an animal that you would love to see featured, let me know by commenting on this post or tweeting me @ChippedNailBlog! Hi y'all! I hope that your Monday is going well and to my Canadian bloggers, happy Victoria Day! I hope you guys have had a relaxed weekend. Well, I've been very busy with work and such so today is a major catch-up day. This week is going to be very exiting and hopefully you guys will enjoy my blog posts. This coming weekend is the Ottawa Marathon where I'll be running my first 10km race! I've been training for this event since December so I'm super pumped and a little nervous. Anyways, today I'm excited to bring you my last nail polish find from my trip to the States. 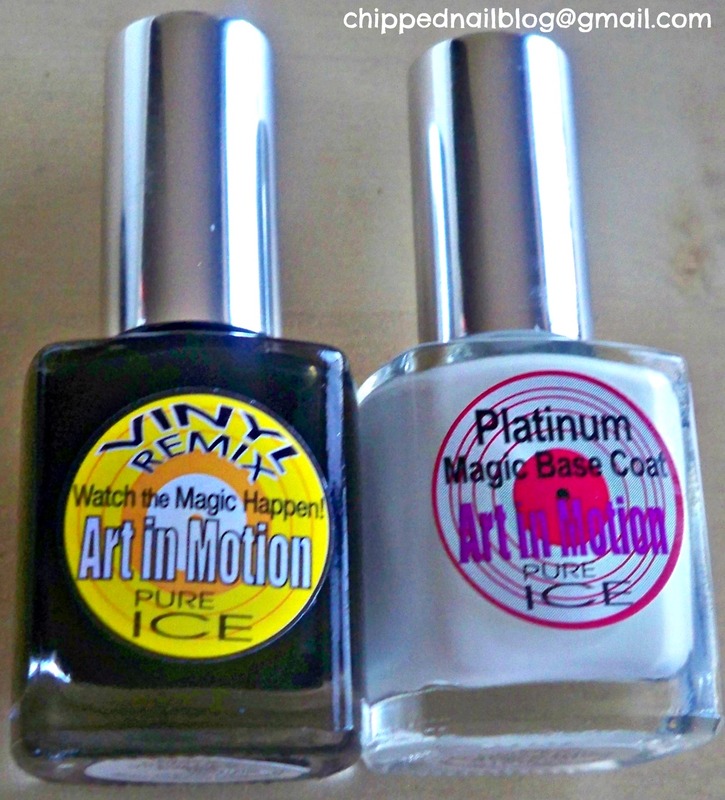 Pure Ice's Vinyl Remix is a new take on the crackle nail polish trend. For around five dollars, this polish comes with a white base colour and a coloured crackle. This collection includes green, yellow, blue, pink, orange, and purple. One downside is that if you picked up all six colours, you would end up with six platinum magic base coats. I was super excited to pick this polish up because of how different it was from the normal crackle polishes. This polish is intended to be used in combination with the other polishes from this collection to create funky nail art. 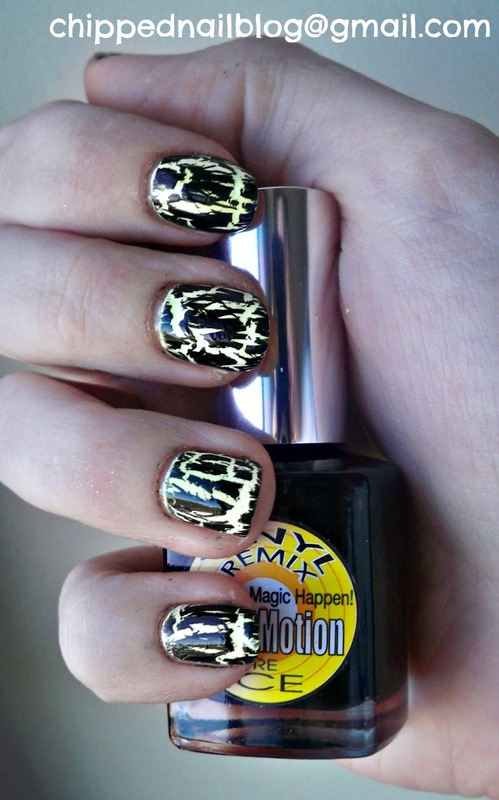 This pretty yellow crackle is called Emcee Me. Personally, I absolutely love how platinum base coat applied. With two coats, the coverage is perfectly even. 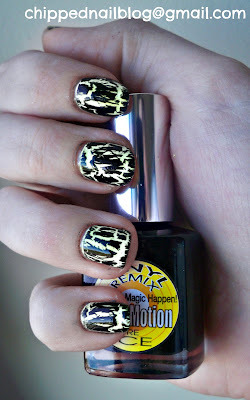 The black crackle is try easy to apply, creating a very dramatic look. Like most crackles, this polish has a matte finish. As a result, I used two coats of Essie's good to go quick dry top coat to give it a glossy finish. Overall, I love this concept. It's a next spin on the traditional crackle that won't hurt the wallet. Honestly, the one major difference between US and Canadian nail polish supplies is the price. American prices are anywhere from two to six dollars cheaper compared to Canadian prices. If I am able to, I would love to pick up more polishes from this collection because I think it would make for some really cool nail art. 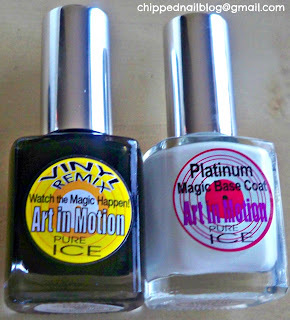 These polishes are available at Walmart or on the pure ice online retailer. I hope you guys have a magnificent Monday! Keep those fingers pretty! Hey! I am a 22 year old university graduate who has a passion for polish and a desire to protect our environment. Feel free to contact me at chippednailblog@gmail.com if you have any questions or concerns or if you want me to review your nail polish! Super Sunday - OPI's Your Web or Mine? Nail of the Day - OPI Just Spotted The Lizard! All images are copyright Chipped and are not permitted for use without written consent. Ethereal theme. Theme images by GelatoPlus. Powered by Blogger.